Marvel Studios is gearing up for the superhero sequel Captain America: The Winter Soldier, which goes into production after Thor: The Dark World wraps later this year. As a result, the studio is currently searching for the female lead, with Anna Kendrick (Up In The Air), Felicity Jones (Like Crazy), and Imogen Poots (Fright Night) considered the front runners, according to The New York Post. It isn’t officially known which character one of these actresses might play, although the speculation is that it’ll be Sharon Carter, who’s the niece of Peggy Carter, played by Hayley Atwell in the first film, and who is the Cap’s love interest in The Winter Soldier comic book arc. Chris Evans is slated to return as Steve Rogers/Captain America, with Anthony Mackie signing on earlier this month to star as The Falcon. Samuel L. Jackson is expected to return as Nick Fury, while Sebastian Stan be back as Bucky Barnes, who transforms into the title villain, The Winter Soldier. Anthony Russo and Joe Russo are directing from a screenplay by Captain America: The First Avenger scribes Christopher Markus and Stephen McFeely. It’s due for release on April 4th, 2014. After years of rewriting, jiggling around, scheduling issues and various other problems, it seems Paramount’s planned reboot of the Jack Ryan franchise, starring Chris Pine, is finally moving forward. A shortlist has now been drawn up for the female lead in the movie – Jack’s future wife – so who could be playing it? Well, while shortlists don’t always lead to the person who’ll finally play the role, at the moment Deadline says that Paramount and director Kenneth Branagh are looking at Keira Knightley, Felicity Jones and Evangeline Lilly for the role. Knightley is considered to be the frontrunner, though the other two are still very much in the mix. Total Recall co-stars Kate Beckinsale and Jessica Biel were both in the running for the part as well at one point, but that seems to no longer be the case. Anne Archer played Jack’s wife in Patriot Games and Clear and Present Danger, but the planned film returns Jack to his early day, before he was married, with Ryan as an ex-Marine who takes a job in Moscow and works to take down his boss(probably played by Branagh), who turns out to be a terrorist working to destroy the United States economy. It still isn’t clear when the movie might shoot, although it’s hoped it’ll go into production before the end of the year. Ah, young love. 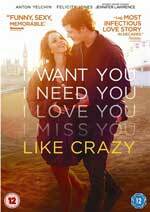 Like Crazy is the sort of film that will either have you reach for the sick bucket, or get you blubbing in the first 10 minutes due to the aching love on display. Anton Yelchin and Felicity Jones are Jacob and Anna, who meet at an LA university while the British Anna is in the US on a student visa.